The present study aims to determine the influence of temperature in the treatment efficiency of the activated sludge systems. To reach this aim, a simulation study is performed using Matlab® programming language. A biological tank is modelled by the ASM3 (activated sludge model No. 3) and a settling tank is modelled by Takács settling velocity model. For a defined inflow rate and inlet waste water characteristics with the predefined design and operational parameters, the treatment model is simulated. The changes in the kinetic parameters by temperature are estimated from the values given in ASM3 and the dissolved oxygen saturation concentration in water is also concerned as a function of temperature. All the other design and the operational conditions are kept constant during simulations. The simulation algorithm is executed for the temperatures 0°C, 10°C, 20°C, and 30°C. The results show that chemical oxygen demand and total suspended solids reduce slightly with increasing temperature, however, the total nitrogen content in the effluent is changing, first increases for the temperatures 10°C, 20°C, and then decreases for 30°C when it is compared to that of at 0°C. The change in temperature affects mostly the ammonium concentration in the waste water treatment systems. 1. Gujer, W, Henze, M, Mino, T, Loosdrecht, M, Activated sludge model no.3, Water Science and Technology, 1999, 39(1), 183-193. 2. Koch, G, Kühni, M, Gujer, W, and Siegrist, H, Calibration and Validation of Activated Sludge Model No.3 for Swiss Municipal Wastewater, Water Research, 2000, Vol. 34, No. 14, 3580-3590. 3. Ni, B.J, Yu, H.Q, Sun, Y.J, Modeling simultaneous autotrophic and heterotrophic growth in aerobic granules, Water Research, 2008, 42, 1583–1594. 4. Chachuat, B, Roche, N, Latifi, M.A, 2005, Optimal aeration control of industrial alternating activated sludge plants, Biochemical Eng. J. 1999, 23, 277-289. 5. 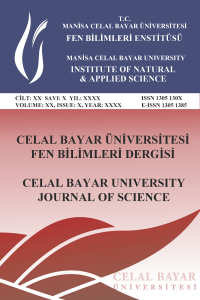 Balku, S, Berber, R, Dynamics of an activated sludge process including nitrification and denitrification; Start-up simulation and optimization using evolutionary algorithm, Computers & Chemical Engineering, 2006, 30(3), 490-499. 6. Balku, S, Comparison between alternating aerobic-anoxic and conventional activated sludge systems, Water Research, 2007, 41(10), 2220-2228. 7. Kreuk, M.K, Pronk, M, van Loosdrecht, M.C.M, Formation of Aerobic Granules and Conversion Processes in an Aerobic Granular Sludge Reactor at Moderate and Low Temperatures, Water Research, 2005, 39, 4476–4484. 8. Wanner, O, Panagiotidisa, P, Clavadetscher, P, Siegrist, S, Effect of heat recovery from raw wastewater on nitrification and nitrogen removal in activated sludge plants, Water Research, 2005, 39, 4725–4734. 10. Henze, M, Gujer, W, Mino, T, Loosdrecht M, Activated sludge models ASM1, ASM2, ASM2d, and ASM3, Scientific and Technical Reports No.9, 2002, London: IWA Publishing. 11. Metcalf and Eddy/Aecom, Wastewater engineering: Treatment and Resource Recovery, 5th ed, McGraw-Hill International Edition, 2014, pp.2018. 12. The Mathworks: Optimization Toolbox, www,mathworks,com, (accessed 24 August 2006).